There are many types of chocolate ranging from cocoa, baking chocolate and eating chocolate. Each variety of chocolate has its own uses; for example if you want to use chocolate in cooking you are advised to use unsweetened, or baking chocolate. 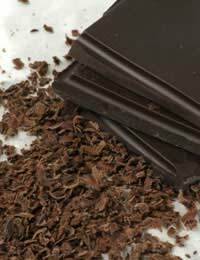 Unsweetened, or baking chocolate is simply the cooled and hardened version of chocolate liquor. However, chocolate liquor is technically not yet chocolate. Despite its name, chocolate liquor contains no alcohol. It is made up of the finely ground nib (or centre) of the cocoa bean to form a smooth liquid. This liquid is quite bitter to taste as it has had no added sugar and is essentially chocolate in its purest form. The liquor is cooled and moulded into blocks, which contain approximately 53% cocoa butter. Baking chocolate is used primarily as an ingredient in cooking recipes, or as a garnish. The instructions on the packet will specify that it is only to be used for baking. You should use baking chocolate if you are making such items as brownies, cakes and cookies. Although it has a more intense flavour than other types of chocolate, baking chocolate may actually have quite a low cocoa-butter content and a comparatively gritty texture. Therefore it is unsuitable for eating on its own, but is perfect for mixing with other ingredients as part of a recipe. Baking chocolate means different things in different countries. For example in the United States, baking chocolate is defined by law as having between 50 and 58% cocoa butter and no sugar or other ingredients. However in the UK, baking chocolate simply refers to a chocolate substitute that is used in cakes and other recipes. This baking chocolate often contains very little cocoa, but has plenty of vegetable fat and artificial flavourings added to it. Luckily, these days the British variety of baking chocolate is rarely found in the shops. However it is still used extensively in commercially-made chocolate recipes in the catering trade. It is important to use the type of chocolate, which is specified in your recipe. For example, you should never use a bittersweet chocolate if the recipe specifies semi-sweet or sweet. However, the importance of the chocolate’s quality actually depends on the amount specified in the recipe. Dishes such as chocolate mousse, chocolate soufflé or chocolate truffles all specify a large amount of chocolate so it’s important that you used the specified type and of the highest quality possible. Baking chocolate varies in definition, but is essentially used primarily for baking in recipes where it is mixed with other ingredients. It is the cooled, hardened version of chocolate liquor, which is the ground nib of the cocoa bean. Unsweetened, or baking chocolate is not to be eaten on its own as its flavour is relatively unpalatable compared with eating chocolate. It is quite bitter to taste and has a gritty texture. It is best mixed with other ingredients and made into delicious treats such as cookies, cakes and chocolate mousses.